I've long been a big fan of the John Tesh Radio Show (which is weird, since I don't like John Tesh...) particularly the "Intelligence for Life" segments. They're full of, well, intellegent information for eveyday life. It's an aptly named segment. 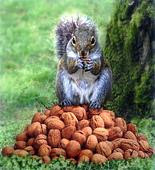 Needless to say, I like information that I can use, and as a writer I hoard information the way a squirrel gathers nuts - I pack as much into my head as a can, and I have little stashes of information every where. In my endless quest to fill my metaphorical cheeks with metaphorical nuts of informational goodness, I subscribed to the Intelligence for Life Newsletter, which has much of the same information, but in an easy to store pdf format. Today, I found a gem among the acorns. The above was basically just a long winded way of saying "I found this cool bit of info via the John Tesh Intelligence for Life Newsletter." Micheal Masterson, author of the book Seven Years to Seven Figures (among others), suggests that the single most effective habit you can adopt to stand out in the workplace is to arrive one hour early every day. An entire hour before anyone else arrives gives you time to work without distractions, it gets you moving at full speed when everyone else is just starting, and that hour gives you a significant head start compared to your colleagues. Keep track of how you spend your time. Actually record it, and review it. One hour a day (minus weekends and a two-week vacation) totals up to 251 hours in a year. If you let your time go by unaccounted for, chances are high that you lose at least an hour a day. 251 hours comes out to be 31 (thirty-one!) eight-hour work days. What would you do with an extra month each year?